For your information: in this dungeon, having Syrup's Potion with you wouldn't be overdoing it! Go forward on the carpet, get rid of the enemies, then hit the switch and cross the two following bridges. Be careful not to stay on the cracked floor. Hit the switch, cross the bridge, then shoot an arrow at the previous switch and cross the next bridge. Now, shoot an arrow at the switch on the right, then break the skulls, create two clones, cross the bridge on the right, push the big block and go north. Get on the platform, move in such way that you will avoid the blocks and get off once you've reached the top. Go west, climb the stairs, then go west on the grate. Go down the stairs, shoot an arrow at the switch to the south and cross the bridge. 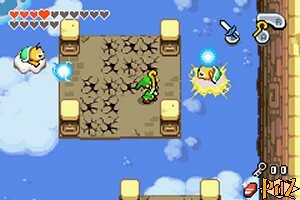 Hit once more the switch, then drop a bomb next to it, quickly cross the bridge, then the next one after the explosion. Fight the Wizzrobes for three rounds, then you will get the Roc's Cape from the chest. Wear it and fly east. To get a Kinstone, go back on the eastern grate, go all the way to the top, use the Roc's Cape to jump and fall on the grated panel, open the chest and go back under the cloud. Stand on the shadow cast by the cloud, press the cape button to jump on the cloud and keep doing this to reach the second floor. Go east, fly east, and once more while avoiding the enemies. Push the blocks to the top, then create two clones on the bottom slabs, go south, stand in the middle of the four switches and quickly swing your sword to hit them all. Then get rid of the enemies with the Cane of Pacci, and go right. Slowly go ahead when the fans stop, go north, fly east, then go south. Use the Cane of Pacci on the hole, then jump to go on west. Get on the grate, and use the Roc's Cape to jump and fall on the grated panel. Go on west, use the Cape to get back on the grate and go west. Do the same to go down on the platform and go back up. Go down the stairs, jump on the cloud and climb to the third floor. When the platform cannot be seen anymore, create two clones, get on the platform and stand to the left of the platform to avoid the blocks. Quickly get off from the left, climb the stairs and quickly push the big block. Go on, go down the stairs and push the three right blocks. Get on the platform, fly to the other one and fly from one platform to another in order to avoid the blocks, then fly south. Use the Roc's Cape to get on the grate, go on east thanks to the Cape and the platform and go east. Get off the grate, use the holes to avoid the roll, use the Cane of Pacci on the hole on the far right and jump east. Stand on the slab to the top left, create two clones on the bottom slabs and quickly swing your sword to switch the buttons. Shrink on the newly created pedestal, go south and push the pots to reach the passage on the left. (If you get stuck, go back up and up again to get on another screen, then start again.) Then go north and take the passage to the north. Go on your way and go back to your normal size. Backtrack, drop a bomb, lift it and toss it on the switch. Pick up a Small Key and go right. Go south, climb the stairs and open the door on the left. Jump on the clouds towards the fourth floor. Go west, cross with your Roc's Cape when the two first fans are stopped, climb the stairs, then push the blocks to go south and go on east. Go down the stairs, when the fan is stopped, be ready to take off, then as soon as it starts again, fly west. Go north, keep flying north while defeating the enemies with the Cane of Pacci, then climb the stairs and go north. 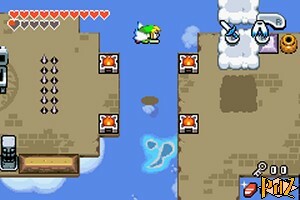 Jump on the three clouds, then fly east between the torches (is this even logical?). Climb the stairs to the south, go east, get rid of the two enemies and open the chest to get a Kinstone. Go back down the stairs, fly right and jump on the first four clouds. Fly once more east, then jump on the clouds to reach the fifth and last floor. Follow the path to the south and fight the two enemies. Stand in front of them, but not too close, then when they are about to throw their weapons, move aside and dash to hit them with your sword. Open the door on the left. Here you can easily refill your hearts: throw your Boomerang at the red foe, pick up the fairy, get out, come back and do it again. Go on left, push a pot on one of the switches, then create two clones on the slabs and walk on the switches. Go on left, step on the switch to activate the fan, then fly in the fan to cross towards south (stand next to the fan, look south, then jump just a bit towards the fan to be propelled in the right direction). Get rid of the two Wizzrobes, along with the two Moblins, then go right. Fly again to the right, then once more step on the switch and fly across with the Cape and the fan. Push the block in front of the chest and pick up a Small Key. Push the two blocks on the right, then open the door at the top. 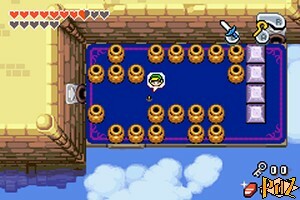 Open the chest to get the Big Key, then come back down and right and open the fake boss door. Breaks the skulls to refill your hearts and jump into the hole!